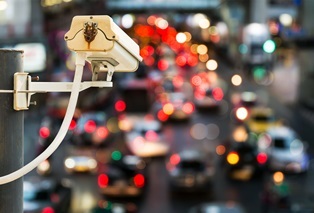 How can I use traffic camera footage to support my personal injury claim? Proving liability is a vital part in establishing your personal injury claim for injuries related to an auto accident. In cases where it's not immediately obvious who is at fault, video footage can become valuable evidence. The law enforcement officer who fills out your initial accident report is not required to provide you with a listing of nearby traffic cameras, so learning about sources of footage will require a bit of personal detective work. The availability of traffic camera footage for your personal injury claim depends on where you were when the accident occurred. If you were on a highway or heavily trafficked thoroughfare, you have a much better chance of finding footage from a nearby camera. You can travel back to the scene of the accident to look for signs of cameras that may have captured the event, but do not confuse traffic cameras with road safety cameras. These devices are intended to enforce specific rules of the road such as obeying speed limits, stopping at a red light, and paying road tolls. They only take still photos when a violation occurs and do not record continuous video footage. Another factor to consider when determining if traffic camera footage will be helpful evidence in your personal injury claim is how long it has been since the accident occurred. When it comes to accessing footage, time is of the essence. In many cases, footage is only kept for 30 days or less due to storage limitations. If your accident occurred near a restaurant, gas station, or retail store, the business's surveillance video may have captured the event. Homeowners who are concerned about theft often incorporate video surveillance into their security systems. These cameras may have captured your accident in a residential neighborhood. In some cases, school buses and public transit buses are equipped with cameras as a safety precaution. If you were traveling near the bus when the accident occurred, it could have been caught on tape. Dash cams are most often associated with police cars, but a surprising number of private citizens have these cameras in their vehicles. If there are witnesses to your accident, it's worth asking if they have dash cams installed in their cars. Although you may get lucky and be able to obtain footage of your accident with a polite request, you will most likely need an attorney's assistance to access the footage. Government-owned traffic camera footage is generally not available without a Freedom of Information Act (FOIA) request and/or subpoena. Businesses also tend to have strict regulations that limit who they will provide their security footage to. Louisiana law allows you to receive personal injury compensation for accident-related injuries if you are a partially at-fault driver, but your settlement is proportionally reduced by your assigned percentage of fault. However, since there is no set formula used to determine percentage of fault, it may still be worth the effort of obtaining footage if you believe you are partially at fault for the accident. Your memories of the event may be incorrect, or your attorney may be able to use the footage to increase your compensation by negotiating a lower percentage of fault. If there is no relevant video footage of your accident, don’t assume you don’t have a viable personal injury claim. Many different types of evidence can be used to establish liability, including witness testimony, vehicle damage reports, law enforcement accident reports, and testimony from accident reconstruction experts.